Dressing your digs can be an arduous chore for even the most stylish of blokes. Even if you get your Feng Shui perfect, your colours in sync and your furniture in alignment, making sure you’ve always got the perfect painting on the wall to set the mood can be a challenge, especially with all the setback of collecting art (it is fun, but cumbersome and expensive). This is why we’re excited about the Depict Frame. Using 4k technology, Depict allows you to feature museum-quality art in your home, to your heart’s content. Giving you the freedom to change up the display whenever you like, the 49″ matte display boasts brilliant colours and low-reflection, making it as close to the real deal as possible, without the hassle of hanging multiple artworks. 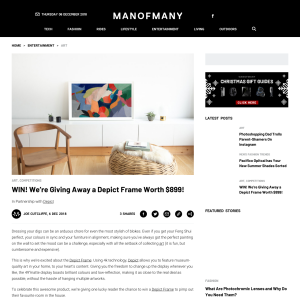 To celebrate this awesome product, we’re giving one lucky reader the chance to win a Depict Frame to pimp out their favourite room in the house. Whether you’re a Man of Monet (heh), Manet or Matisse, everybody knows that a bit of art on the walls goes a long way, and with Depict, you can ensure your den is cultured and classy at all times. To ENTER, all you have to do is complete the Gleam form below. To learn more about Depict, visit their website here. Competition entry is via http://manofmany.com/ or directly via the form on a special page at http://manofmany.com/. Entry requires your email address. Entries are open to residents in the United States only. The competition is open to entrants from 8AM 6th of December 2018 to 11:59PM 20th December 2018. Employees and the relatives of employees of Man of Many are excluded from entering. Winner/s are selected based on a game of skill. Winner/s must be subscribed to our and Depict's mailing list at the time of the draw, otherwise, their entry will be deemed invalid. Winner/s will be notified via email. The competition will be drawn at Suite 3, Level 2, 66 Oxford St, Darlinghurst, NSW 2010 the following day after the competition closes and the winners will be notified on the same date via email. If the winner does not wish to accept the prize they will need to inform us immediately and we will re-draw the prize. Total retail prize value for the Depict Digital Canvas is $899. The prize is as follows: 1 x Depict Digital Canvas worth $899. One major prize winner will receive a Depict Digital Canvas worth $899. Prizes must be claimed by the 7th of January 2019. In the event a winner does not take the prize by the time stipulated, then the entire prize will be forfeited by the winner. In the event that any prizes are unclaimed after a period of 2 weeks, an unclaimed prize draw will take place at Suite 3, Level 2, 66 Oxford St, Darlinghurst, NSW 2010. Promoters decision is final and no correspondence will be entered into. The Promoter is Man of Many Pty Ltd ABN 17 499 702 143 of Suite 3, Level 2, 66 Oxford St, Darlinghurst, NSW 2010.